Did you want to set up your own Intrusion Analysis department? Or at least give a framework for creating a method to understand a breach. Then read this document at threatconnect.com¹ by Sergio Caltagirone, Andrew Pendergast, and Christopher Betz. 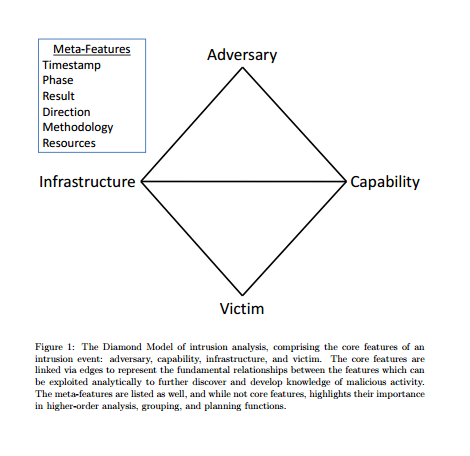 This document goes into the details of what the attacker/adversary can do to your infrastructure and the “Victim” or target machine. 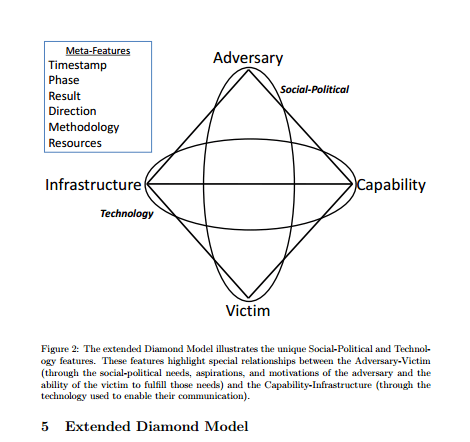 There is a lot more than the Diamond model as there are comprehensive potential angles or as the Cybersecurity industry calls it “the vectors of attack”. (where the attacker comes in and where he goes from there) each potential target leads to another target and another, until the attacker is in the network and does whatever they please. This model was created to put something together for when a network is compromised. It is always better to be prepared for when this event happens (not if). When you are compromised where in the attack is the compromise located? In the next table (page 31) the attacker is pivoting from system to system, delivering his payloads and attack angles as more systems become compromised. Where there is one compromise there could be more. I have tried to make these concepts simpler to understand with my SVAPE&C² explanation – Scan, Vulnerability Analysis, Penetrate and Exploit – with the end result being control of systems. The end result is the same – the hacker does what they please while your admins are running around trying to play catch-up.